YAY! *Cheers* We've reached the last day of my blogoversary party!! :) *BIG SMILES* It just so happens I've ended it on the day I started it! One Year ago I started Reading A Little Bit Of Everything! Wow, How far I've come! It's been such an amazing, eye opening, explosive, thrilling year! and I wouldn't change any minute of it if I could! There are so many people I want to thank for helping through my year of blogging. Of course my lovely followers for following my blog that are interested in my posts. Also to those who take the time out to comment on posts! I love comments!! Makes me feel like people actually care what I do on my blog and like it!! THANK YOU!!! 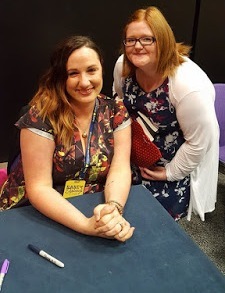 First to the authors who have taken part through my 10 day blogoversary party! I organised it on such short notice and all authors helped me so much by taken part! THANK YOU! I really appreciate it! A massive thanks to Jana Oliver, C.A Kunz, Jennifer Laurens, Samantha Young and Alecia Stone! I'm so thankful! To all the authors I have had on my blog in the past year doing interviews, guest posts, character interviews/profiles and participating in giveaways and all that! A MASSIVE TY! I wouldn't have been able to blog really without so many nice authors taking the time out and being on my blog! I also turned 18 this year! :) So now I was officially an adult I started a book blog for my more . . . adult side . . . The name gives it away! Shhhh!! A Redheads Guilty Reads <-----Click!! There have been so many high and low times on my blog! To name but a few one was when I changed the URL link of my blog and lost all my 400 followers which I'd gained in my first 3 months of blogging and had to start it again. . . :O Although at the time I was very annoyed with myself for doing I suppose it was good thing as alot of people who had followed it starting following this one! So THANK YOU A BUNCH! Give yourself a big hug from me! :) A very very high point though has to be when I interviewed Paige Toon and Jana Oliver! I mean to me in the book world there like Justin Bieber to a Belieber in the music world! I love there writing and with every novel there novels get better and better I couldn't believe when I had them on my blog! :) It was just an amazing feeling!! Plus Jane Green! I mean Jane Green an author whose novels I love so much! Also I've reviewed some pretty amazing books in the last year too! I have also some neat giveaways going atm in aid of the blogoversary! I didn't quite reach my goal of 500 followers but I'm darn lucky to have as many as I do! THANK YOU! I also have my Get to know your blogger event which is every Saturday! Again click the tab lol titled Get to know your blogger my email address is in the tab! So . . . is this the end of the post? I guess it is! So who's gona stay with me for another fun filled year??? I want to make this next year even better! So any opinions or ideas you have for my blog please share!! You can leave a comment or email me! If you want to see something on my blog tell me! ANYTHING will be gratefully welcomed! Unless of course you tell me any of my fictional boyfriends are yours which their not! Have you realised most of them prefer redheads? YAY! :) Anyways before I get side tracked! I also have totes awesome stuff planned which is all secret SORRY! until I get confirmation for it! So look out!! :) Some amazing authors may be . . dropping . . . by!!! :) Shhhh!!! What's been your highlight on my blog this year? Anything you want to see on my blog? Have you enjoyed the blogoversary party? Any book recommendations? Anything at all you wanna share? YAY! So glad you think so. :) TY! lol I appreciate your support so much. Thanks for this quite innovative post. keep blogging. My highlights are always going to be author interviews. Writers are my heroes.